Summer is the perfect time for weekend cookouts, group dinners, and large parties and there’s no better way to host this fun than outside than on your beautiful wooden deck. But maybe you use your deck frequently or have had it for several years and it needs some repair and a new shine. You may not have to buy or build a new deck; instead, consider renovating your deck. It’s a more budget-friendly option and will make your deck look new again. 1) Major structural damage – Determining whether you have serious structural damage to your deck is key to understanding if your renovation is possible and, if it is, how much it will cost. Take a screwdriver and give firm prods to the posts, planks, railings and stairs of your deck to check for rot. If the screwdriver sinks when you press it into the wood then you’ll know you have to perform serious renovation. (If your deck is old and rotten and you’re considering building a new deck, read our article about whether you should hire a deck pro or DIY here). 2) Deck-to-house connection – Next, examine how securely the deck is anchored to the house. Shake the deck to check stability and carefully examine the bolts and screws connecting the deck to the house, checking for wobble or rust. 3) Cosmetic Issues – Lastly, you want to investigate the parts of the deck that show. Look for loose or missing nails, rough wood, and splinters on the boards, railings and stairs of your deck. Make sure to fix these problems and consider performing a heavy-duty sanding of your deck surface. Making sure that your deck is clean is the next part of the renovation process. 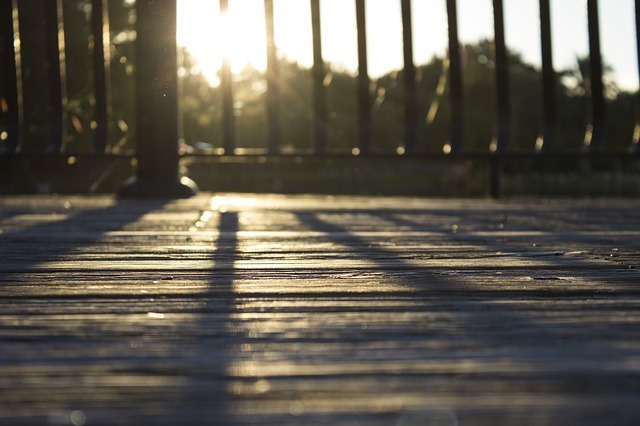 To maintain healthy wood and a great looking surface, you should plan on cleaning your deck once a year. Most decks only require a power wash, which are great for cleaning the surface of your deck and digging dirt out of the grain of your wood. If you want to go the extra mile, consider deck cleaning products which add shine and protection. Staining your deck is the final stage of deck renovation. Stains add rich texture and a sleek shine to your deck. However, picking the color of a stain is only part of the process. The other part is picking out a stain that is right for the quality of your wood. For decks with quality wood with a smooth surface, a transparent stain might be the way to go. It provides a nice finish but allows you to see the wood grain through the stain. If your deck takes heavy beatings (parties, kids, pets, etc) then a solid latex-based stain or the stain RESTORE® may be a better fit. Solid latex-based stains are water resistant (but they hide more of the wood grain). This a popular stain and many people choose two tones, staining staining the rings of the deck lighter than the surface itself. RESTORE® is another popular heavy-duty deck stain that is 10X thicker than paint, which fills the cracks but has a sandy texture to retain surface grip. This is a great option for older decks and decks used by children. It has a 10-15 year warranty and, like a latex-based stain, is water resistant. Renovating a deck is a great way to add value and beauty to your home. Whether you’re thinking about renovating a deck or you’re set on doing it yourself take a few minutes and talk to a deck building professional about your project. Illinado Home Solutions, LLC is your experienced Renovation & Deck Building company offering custom renovation and deck repair services. Our crew is waiting to help you improve your home and your lifestyle with a newly renovated deck.